Let me explain the 'messed up prices.' There were a plethora of signs boasting "80% off" or "Everything half off", yada yada yada. Let me just tell you that they are JACKING the prices UP then lowering them. A jewelry store was going out of business and everything was 80% off and then after that an additional 20% off. So, who in their right mind could pass THAT up? 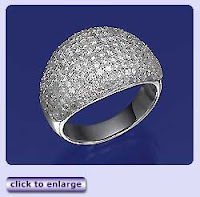 We went in, found a fabulously gorgeous dome pave diamond ring. (Looked very similar to the ring pictured to the right.) "I'd like to try that on, please." After further inspection of this magnificent piece of art she shared the price. Now, my hubby and I know a lot about the proper pricing of diamonds. We know all \ about color, cut, clarity, ct. For the quality it was we were figuring the original price would be at the absolute max $2000-$3000 and that is jacked up 'max'. (After all the sales it should land around $400 if it were originally $2500.) The 'price' they had it originally marked at was $12,999! HAHAHAHAHA YEAH RIGHT! Fools. Whatever. I did notice that prices throughout the mall were jacked up before the 'sale' prices. That's not very nice at all and really rude to people who aren't familiar with the value of products. At least it only cost us $28 to fill up our empty tank today. Totally random thought. I love gas prices being back down and hope it lasts a long time. Exposures.com - Upgrade to Overnight Shipping at Exposures for the cost of Standard Shipping (a $32 value) on orders over $100. Use code 40618000017 and choose FedEx Standard Overnight at checkout. Offer ends 12/20/08. Walter Drake - Upgrade to Overnight Shipping at Walter Drake for the cost of Standard Shipping (a $32 value) on orders over $75. Use code 80618000006 and choose FedEx Standard Overnight at checkout. Offer ends 12.20.08. --Mikasa's Shogun Blue Blub Vase is now on sale. Originally $68.00, now just $40.00. 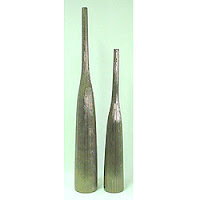 --Mikasa's Akito tall vase makes a statement! Now just $20.00, originally $125.00. --Mikasa's Sasaki Green Vase is stunning. Now just $30.00, originally $70.00. --Mikasa's Echo Frost Bowl is now 50% off. Makes a great gift! --10% off + FREE shipping on orders of $99 or more. Use code HOLLY08 to save. Offer ends Dec 31. --Get 20% off all DVDs at the Nick Shop! --Get 20% off all Dora the Explorer Merchandise at the Nick Shop! 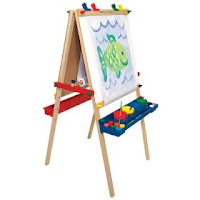 Thank you Joanne for letting me know that this easel has dropped in price even more! Of course Restaurant.com has a fabulous deal going on... 70% off! Get $25 gift certificates for only $3 AND get a FREE $15 deLaFlowers gift certificate with every order!! ENDS TODAY. Use Code WRAP at checkout and hit apply. Alright, enough of the chatter...here's the FOOD!!! Thursday: Slow Cooker Chicken Taco Soup - I'll post this recipe on Slow Cooking Thursday (photo to right) - I add 1 tsp garlic powder, 1/2 tsp cumin & 4 tbsp taco seasoning and sub a can of chicken broth for the beer. Friday: Baked Salmon with Coconut Crust - I combine 2 tablespoons of butter (melted) and one table spoon of brown sugar then drizzled it on top of the coconut crust during the last 6 minutes of baking. It makes a fabulous coating and adds flavor. Have you ever paid too much for something? If so, what was it? Yay! Thank you SO much Melody! Since I quit my job, my hubby and I hardly ever go out to eat even though that's my fave thing to do! Now I have a really good excuse to eat out! Woo hoo! Honestly, thanks. $12,999 for a ring that was worth around $2500? That's just so wrong on so many levels. I did the math and they'd be getting their 'real' original price by jacking it up that high. So wrong. Your menu looks wonderful. I'm going to try the Turkey Cranberry Chipotle and the Chicken Taco Soup! Sounds so yummy! Yes, I'm sure I've paid too much for things. I usually only buy on sale items, but occasionally there are things I want now before they sell out or because I'm tired of looking for it cheaper! haha The things that fall into this are dressy outfits needed for events like Christmas parties, banquets, etc and home decor. Oh..I love that ring..it would be fun to wear at a Christmas party! I am always paying too much!!! The menu sounds delish--as does a restaurant.com gift certificate! My daughter wanted a down vest this year. Well I found some at Target and looked at the price tag of a blue one...it was marked down to $25. A little high but I hadn't found one anywhere else so I grabbed her size in a black one. Checked out and looked at my receipt and the vest rang up $40...ummmm....so I went to customer service and they explained the BLUE one was on sale...not the black...UGH! I kept it anyways cuz she really wants it. I had a history of paying the first price I saw for whatever it is I wanted when I was working. Now that I am a SAHM, I do a lot of price comparing. Your cranberry chipotle turkey and chicken soup sound delish! Thanks for all the links to check out. Thank you so much for picking me. I don't feel like the last kid picked in the kick ball game anymore! 80% off then 20% off hummm 80 + 20 = 110% off? LOL Yeah I would like my free ring now. Pay too much for something? If so it would have to be food somewhere. That is my downfall. But with my coupons that won't be the case now! WHIPEEE! totally coming to your place for dinner this week....I will bring the wine. Good Morning! Hope you had a nice weekend! I can't think of anything specific, but I especially hate going to a clothing store and finding something I've bought for way less than I actually paid. That's always a bummer. If I have paid too much for something, I happily don't remember it. It's rainy and cold in Arkansas, that soup looks perfect for today! wow; thanks for the reminder and heads up about the sales! Isn't that so crazy!? I found the same thing at Kohl's; after thanksgiving "special sales", that are still going on! Next time i'll remember that and not wake up early to go shopping! I'm sure I spend too much for things more often than I'd care to admit. And I appreciate the deals on the Mikasa items. Our fine china is a Mikasa pattern. Love it! Your weekly menu items sound delish. I just started making weekly menus and it helps so much. Oh my sister LOVES everything Mikasa! Thanks for those deal! The menu sounds mouth watering! Can I come over for dinner? not only are stores and companies raising prices before the sales, they are also making products in smaller sizes! especially food products. that is very frustrating!!!! Your menu for the week sounds yummy, expectually the slow cooker chicken taco soup! I like that bracelet. Is this is bracelet or ring? When will you send me that gift?